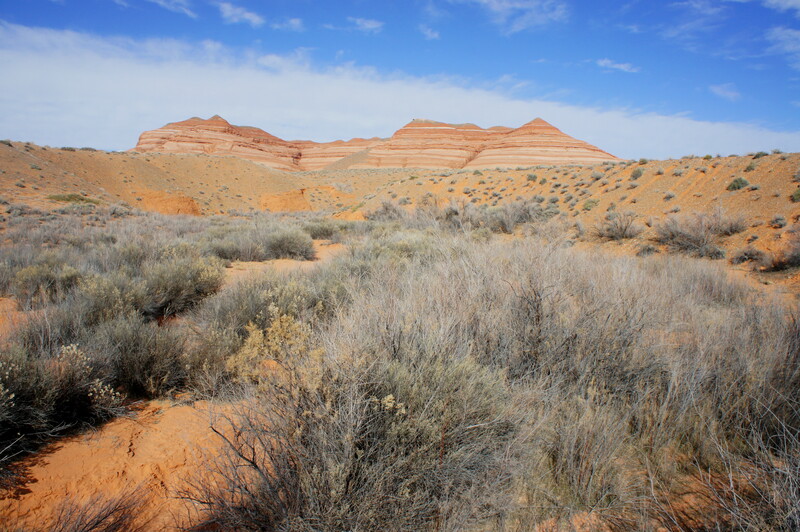 Finding the trailhead for this slot canyon adventure is quite easy: simply follow Highway 276 toward its southern terminus and park in the mammoth lot adjacent to the Bullfrog Visitor Center. The slot is 200 feet away—the obvious drainage just to the north. 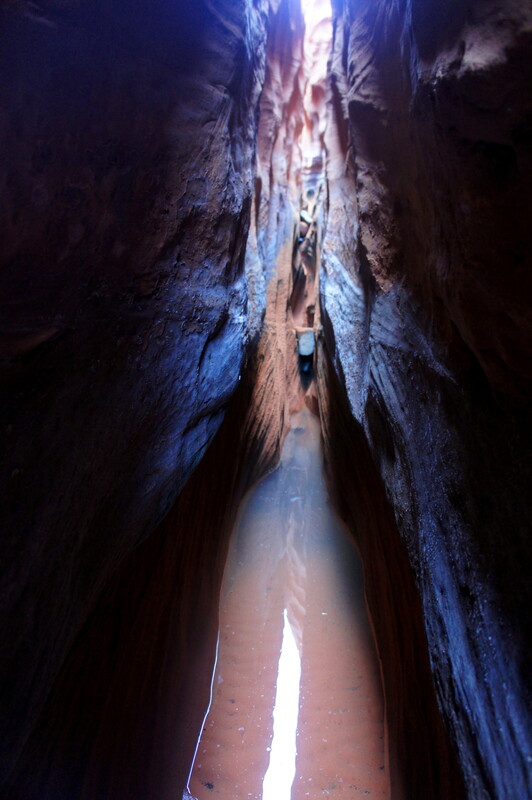 Accessing the slot, however, is much trickier—as the steeply-sloping Entrada prevents an easy climb to the wash bottom. A few options are available, however. Ranging from easiest to hardest, they are as follows. The first, least adventurous choice, is to walk (or drive) 7/10 mile up the road (west) to the Bullfrog RV Park, located atop a hill overlooking a brushy, open section of the canyon. 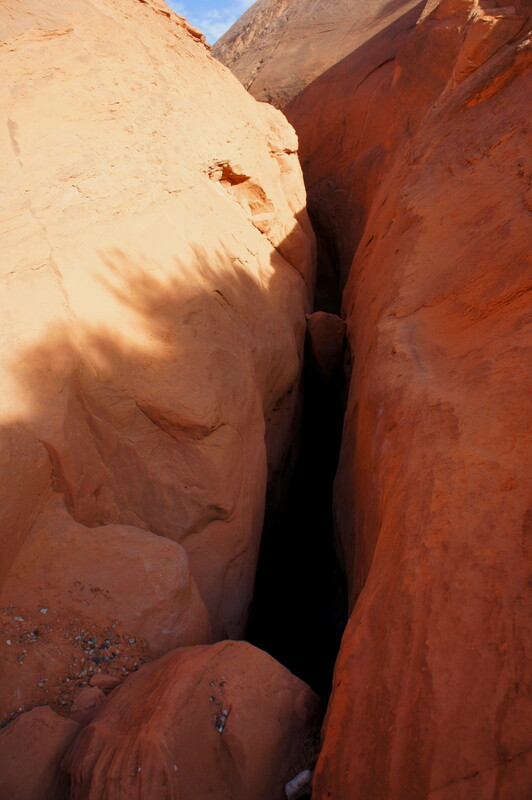 A steep, sandy—but veritably safe—trail descends from one of the RV spots to the wash bottom. From here, turn right—passing the road and a man-made drainage tunnel on your right. The slot’s lowermost section begins shortly thereafter. 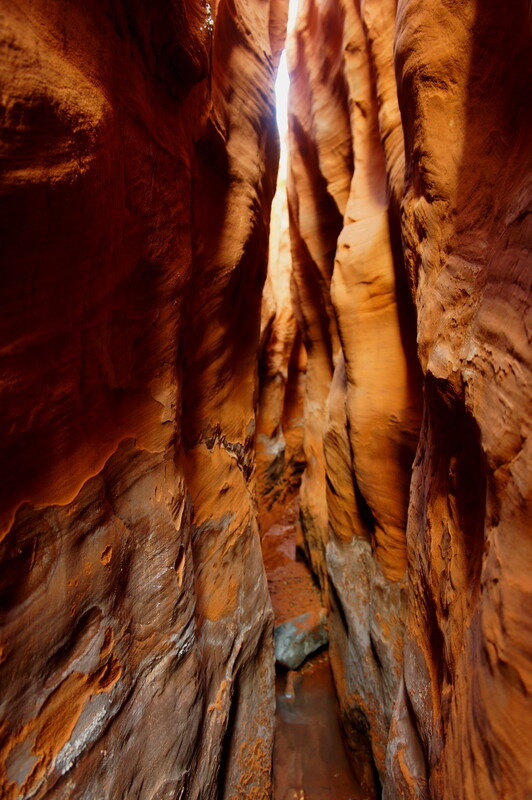 The second and third options involve a bit of climbing, recommended only for the sure-footed. One entrance involves following a faint path northeast from the “NPS Emergency Vehicle Parking” sign next to the visitor center clinic. Skirt the southern slope of the canyon for around 100-150 yards to a slight ease in the slope—a lone cottonwood tree marks the spot (if you reach a wire fence and a fork in the canyon, you have gone too far). Here the descent is guided by seemingly man-made steps in the rock, though the climb may involve using both hands and feet. 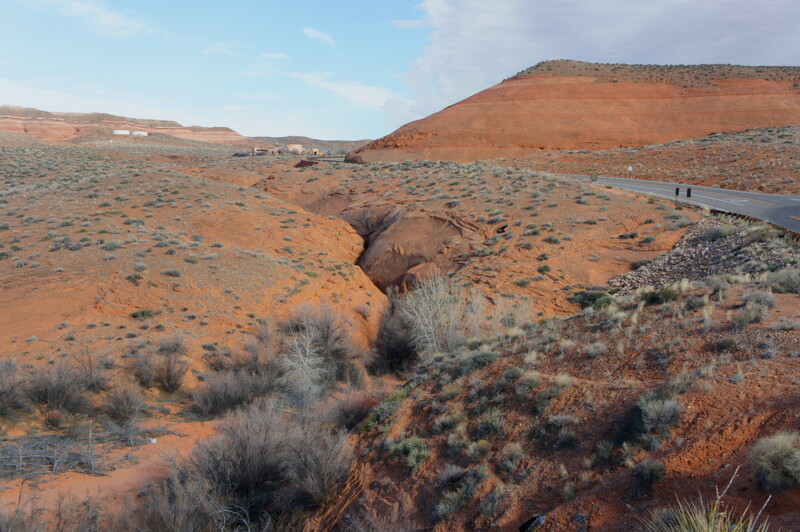 The final option cannot be verified for sure (as I did not try it), but it appears possible to drop into the wash at a less narrow section west-northwest of the parking area. 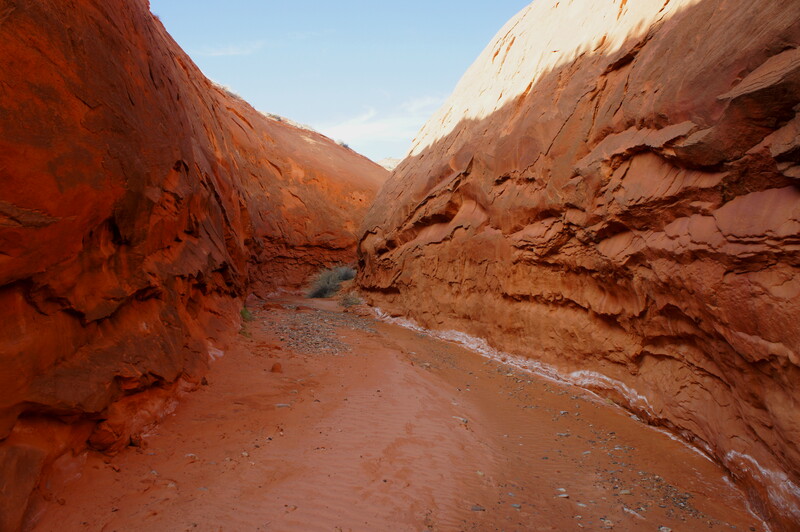 Here a sign indicates the start of the “Red Wash Trail.” The trail itself may zig-zag down to the wash. The lower slot runs for approximately ¼ mile, though with the tight squeezes and occasional obstacles, it feels much longer. More likely than not, the most frequent obstruction will be 1-12 inch pools, some of which require stemming—or a big leap—to avoid. 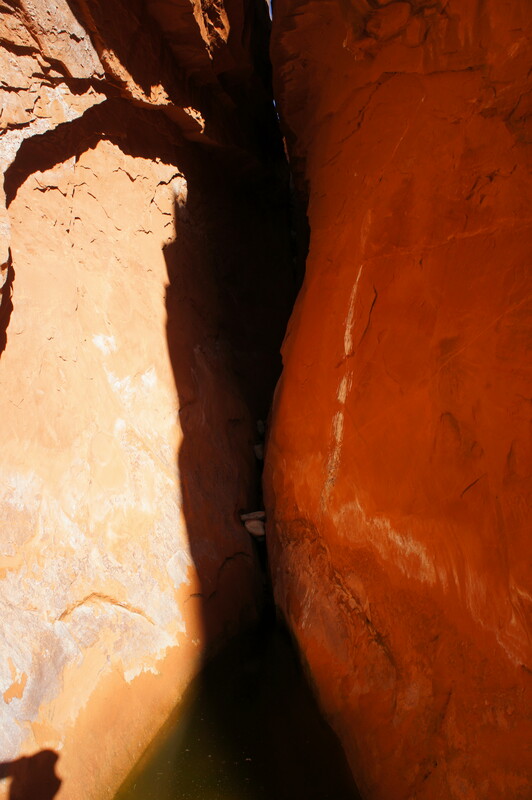 Hikers should enter the slot expecting to get their feet wet. Wear old clothes as well—as you are bound to scrape against the sand-strewn walls in some of the tightest sections. The bottom of the lower slot, at the time I visited, was guarded by a pair of two small chockstones wedged between the walls (this, of course, could change), with a thin space horizontally between them. An easier option is to chimney up and over both stones, then drop back into the slot. Aside from minor boulder jams (none higher than 2-3 feet) and some pool-hopping, there are no other significant obstacles in the slot. 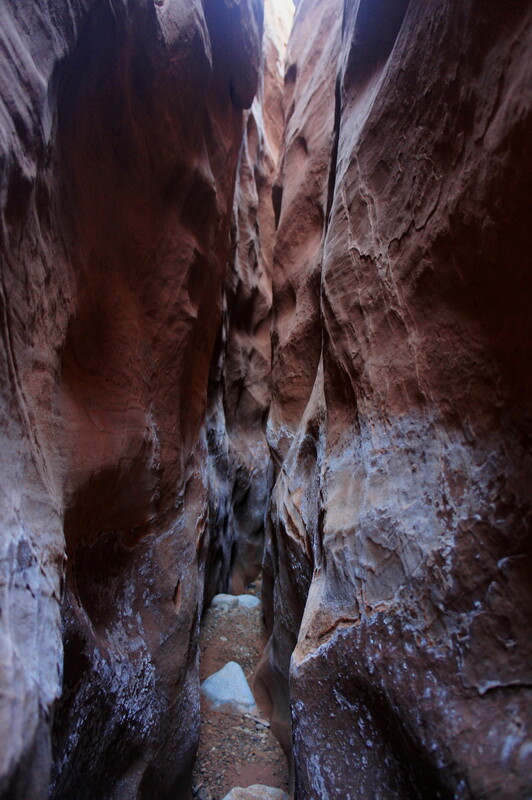 The lower slot features the hike’s highest walls and arguably the most impressive narrows, which are tight—less than shoulders’ width at times—and dark. Backpacks will almost certainly need to be removed and carried in a number of places. 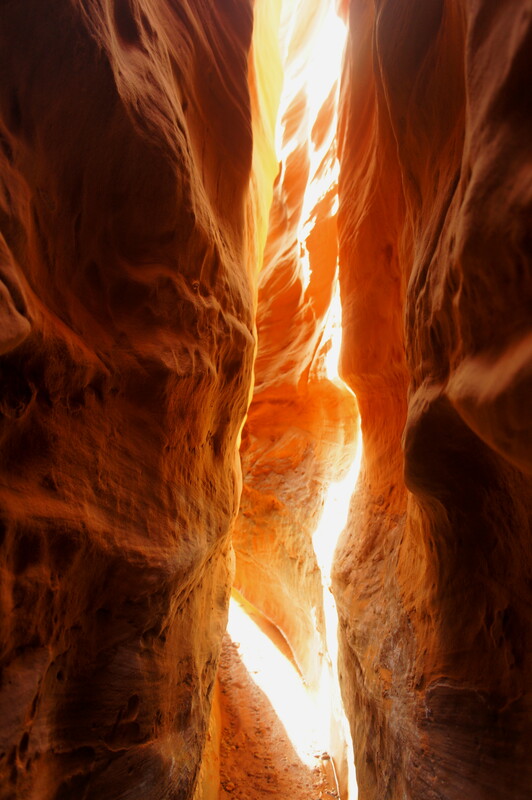 The potential irritations—sand, water, or insects—are certainly worth bearing for the opportunity to pass through stunning, wavy narrows. The undulating walls make for fantastic photo opportunities (and left me, at least, breathless, eagerly anticipating what comes next at every turn). Alas, after about 700 feet, there is one big break that lasts about as long as the lower slot—here the walls recede ever so slightly to reveal the full sun above. Willows, cottonwoods, and tall grasses abound. Here you are within striking distance of the visitor center—though it remains virtually inaccessible due to the near-vertical walls (with the possible exception of entry option #3). As the canyon edges northeast, it again reenters dark and sinuous narrows (as of my visit in February 2015, the entrance was guarded by an ankle-deep pool that can be avoided by careful stemming). There is another brief respite after a short stretch of slot (here I spotted the cattails). The thinnest and darkest section of the upper slot comes shortly upstream from the lone cottonwood (the marker for entry option #2). 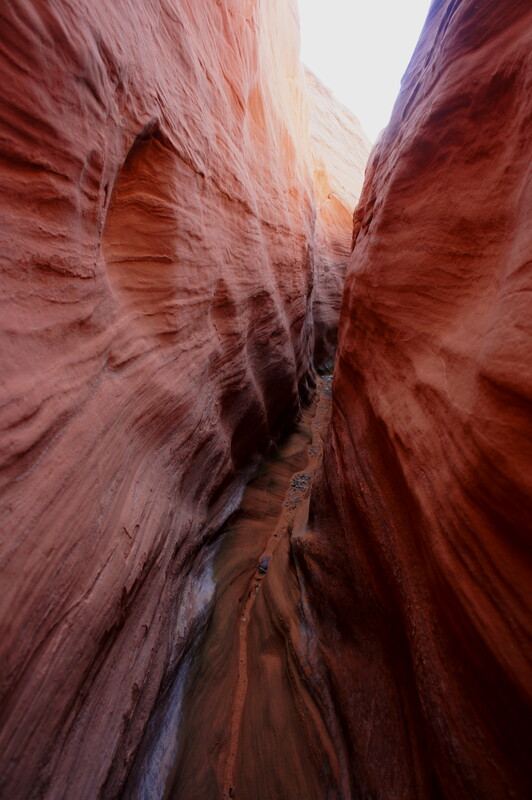 Here the awesome, wavy walls resume and the canyon again thins to less than shoulders’ width. With extra time, consider backtracking to the western exit of the lower slot section, where the canyon edges the side of Highway 276 and opens up to a broad, brushy wetland. Here the drainage carving the slot comes in from the east to join with another fork that continues farther north. Follow this wash north to another junction: while the right fork ends quickly at a 15-foot dryfall (perhaps surmountable to experienced climbers), the left fork continues through a nice section of narrows for almost ¼ mile. 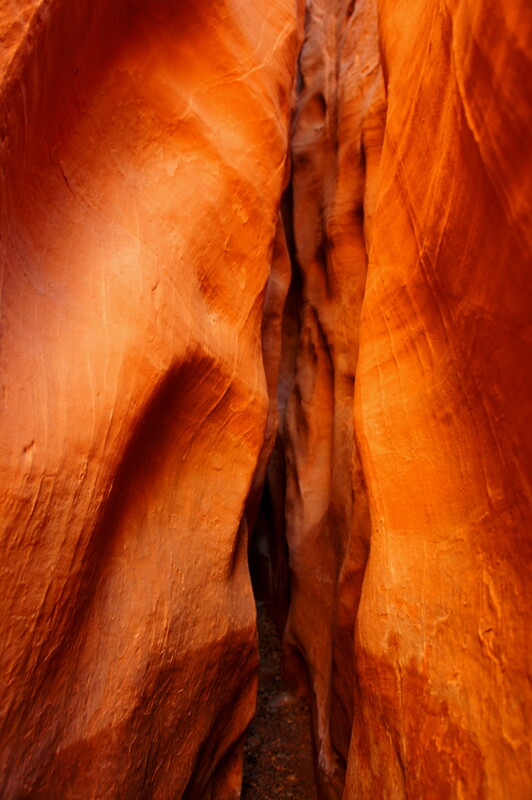 While not quite the tight slot like before, the subway-like bends offer an impressive display of Entrada sandstone. 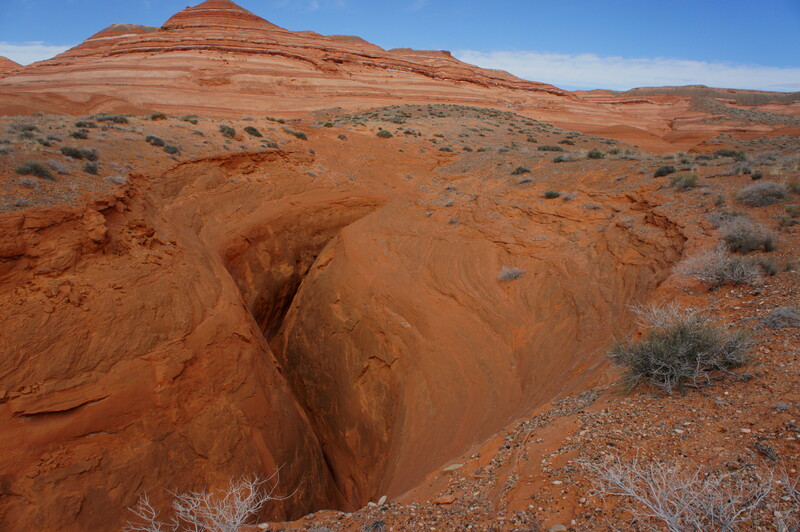 This wash too ends at a steep dryfall—preceded by a deep pool—that, though virtually impassable, is scenic in itself. 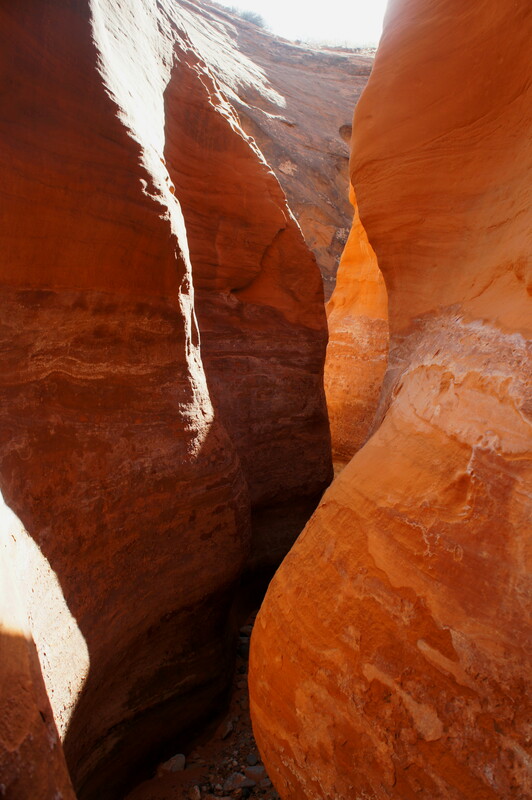 This entry was posted in Glen Canyon National Recreation Area, Moderate Hikes, Utah and tagged Bullfrog, Bullfrog Bay slot canyon, Bullfrog slot canyon, canyon, Entrada sandstone, Glen Canyon, Hoskinnini Mesa, Lake Powell, Narrows, Red Wash Trail, slot, Utah. Bookmark the permalink.